Editor's note: The following is a free translation of a story that appeared in the Israeli newspaper Yediot Achronot on Iyar 4, 5717 (May 5, 1957). We have left the article basically as it was originally published despite the fact that it contains some factual inaccuracies, because of its vivid portrayal of the mood of the time and the Israeli reporter's impression of the people and the events he describes. For additional information, read this historical account of these same events. On the eve of Yom HaAtzmaut (Independence Day) last year, as the bonfires were being raised on Mount Herzl in Jerusalem, the lights were burning also in Tzafrir (Kfar Chabad), the Chabad-Lubavitcher village in the Lod Valley. For four days the village had been in deep mourning and grievous anguish, the likes of which the Lubavitcher chassidim had not known in many years. On that black and bitter night, a band of fedayeen entered the village. They made their way to the synagogue of the local agricultural school, where the school's young students were in the midst of the evening maariv prayers, and raked the room with fire from their Karl-Gustav rifles. They reaped a cruel blood-harvest: five children and one teacher were killed and another ten children wounded; their pure, holy blood soaking the siddurim that fell from their hands and splattering the synagogue's white-washed walls. The village chassidim, brawny, broad-shouldered Russian Jews with thick black beards and bushy brows, stood dumbfounded before the terrible scene that met their eyes. A pogrom in Israel! 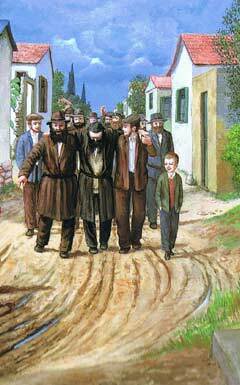 A pogrom in Chabad! they whispered, and bit their lips in rage. The women stood there too, hefty, handsome Russian matrons, wringing their hands and murmuring to themselves in Russian and Hebrew, their eyes emitting an endless stream of tears. This was not a common scene for the Lubavitchers. These Chassidim, who had survived the pogroms in Czar Nikolai's Russia and whom the Red Army could not intimidate, who had been banished to the frozen plains of Siberia, whose backs decades in Stalin's prisons and camps could not bow, now stood stooped and despairing. Now, that the blow had hit home in the heart of the Jewish state. In the center of the village stood Rabbi Avraham Maayor who had been a high-ranking officer in the Russian Army. Avraham Maayor, of whom legend told that he calmly stood and sang chassidic melodies as a band of soldiers beat him with the butts of their rifles, now stood crying out at the heavens: "Master of the Universe, Why?! How have the children sinned?!" Despair and dejection pervaded the village, and began to eat away at its foundations. There were some who saw what happened as a sign that their dream of a peaceful life in the Holy Land was premature. Perhaps we should disband, seek refuge in safer havens? The village was slowly dying. But it was clear to all that before any decisive move would be made, the Rebbe had to be consulted. Nothing would be done without his knowledge and consent. All awaited the telegram from "there," from New York, but the telegram was inexplicably not forthcoming. Four days had passed since the terror had struck. A lengthy telegram had immediately been dispatched informing the Rebbe of all the details of the tragedy, and an answer was expected that very night. But the Rebbe was silent. What happened, many wondered, why doesn't he respond? Has he not a word of comfort for his stricken followers? A telegram from the Rebbe, it should be clarified, is an integral part of Chabad-Chassidic life across the globe. Every problem, every decision pertaining to the communal or private life of the Lubavitcher chassid is referred to the Rebbe's headquarters in Brooklyn, and whatever the reply, that is what is done. And the answer is always forthcoming, whether by regular post, express mail, or emergency telegram-depending upon the urgency of the matter-and always short, succinct, and to the point. Why, then, is the Rebbe's answer on such a fateful matter tarrying? The village elders had no explanation, and, as the hours and days went by, the question continued to plague their tormented souls, and their anguish and despair weighed increasingly heavier on their hearts. And then, four days after the tragedy, the telegram arrived. The news spread throughout the village: A telegram from the Rebbe! The telegram has arrived! The entire village, men, women and children, assembled in the village square to hear the Rebbe's reply. And the Rebbe was characteristically succinct. The telegram contained a single sentence-three Hebrew words-but these three words sufficed to save the village from disintegration and its inhabitants from despair. Behemshech habinyan tinacheimu, wrote the Lubavitcher Rebbe, Rabbi Menachem Mendel Schneerson. "By your continued building will you be comforted." The Chassidim of Kfar Chabad now had a firm grasp on their future: they knew what they had to do. They must build! The Rebbe said to build! And that by their continued building they will be comforted! That very night the village elders held a meeting to discuss how the Rebbe's directive might be implemented. After a short discussion, a decision was reached: a vocational school will be built where children from disadvantaged backgrounds will be taught the printing trade. On the very spot where the blood was spilled, the building will be raised. The next morning, all residents of the village gathered at the empty lot adjoining the agricultural school and began clearing and leveling the land in preparation for the building. The joy was back in their eyes. In the weeks that followed, letters arriving from relatives and friends in New York described what had transpired there in those four endless days in which the village had awaited the Rebbe's reply. For the entire month of Nissan, the month of the redemption, it is the Rebbe's custom to devote himself entirely to the service of the Creator, reducing his contact with his Chassidim to a minimum. Rare is the individual who is granted an audience with the Rebbe in this period, and all but the most urgent correspondence is postponed until the close of the auspicious month. When the month of Nissan ends, a festive farbrengen (Chassidic gathering) is held at the Rebbe's headquarters on Eastern Parkway in Brooklyn, marking the Rebbe's resumption of his involvement with his thousands of followers across the globe. The Rebbe speaks for hours, his talks interspersed with bouts of song and l'chaims, often until the wee hours of the morning. That year, the farbrengen marking the close of Nissan was also held. The tragic news from the Holy Land had arrived in New York moments before the farbrengen was scheduled to begin, but the Rebbe's secretaries decided to withhold the news from him until after the gathering. But what his assistants did not tell him, his heart seems to have told him. That night, the Rebbe spoke of Jewish self-sacrifice and martyrdom al kiddush Hashem (for the sanctification of G‑d's name), about the rebuilding of the Holy Land, and the redemption of Israel. Tears flowed from his eyes as he spoke. All night he spoke and wept, sang and wept, and wept still more. Why is the Rebbe weeping? Only a few of those present could guess-those who knew about the telegram from Kfar Chabad. The farbrengen ended. The chassidim dispersed to their homes, and the Rebbe retired to his room. With great trepidation, two of the Rebbe's closest chassidim knocked on the Rebbe's door and handed him the telegram from Israel. The Rebbe sank into his chair. He locked his door and did not open it for three days. After three days of utter seclusion, he called his secretary and dictated his reply: Behemshech habinyan tinacheimu. By your continued building you will be comforted. The chassidim of Kfar Chabad have fulfilled their Rebbe's request. Without the aid of philanthropists or foundations, they have raised 50,000 Israeli pounds, and today, one year after the tragedy, the new building of the vocational school is completed. Tomorrow, as the citizens of Israel celebrate their eighth Independence Day, the chassidim of Kfar Chabad will hold a farbrengen and relate, again and again, the story of the three-word telegram that saved the village. Can we make peace with this? The Rebbe who Saves A Village Many Thanks for the Story. Why does this story sound so familiar to me? The was a man that came to the States not long ago telling our community a story so close to this one. But he told it as if he were there. The Rebbe: Thank G-d for the Rebbe, truly a great man, truth. I pray that all who read this should be well. Indomitable Spirit The same indomitable spirit the Rebbe instilled into the chassidim then still exists and in fact continues to spill over for others to become inspired. To anonymous from Nov 30 I had forgotten how sad cynics are and how empty and pathetic cynicism is (or is it the other way round?). May G-d help you to be more positive, and thereby to alleviate your pain. Thank you Chabad.org for the very apposite and inspirational account of the Rebbe and his remarkable ability with three carefully chosen words to change the perspective and direction of a whole community. I believe the Rebbe's response would have been the same today with regard to recent events in Mumbai as it was then. At the same time I have been uplifted noticing and contemplating how wonderful and unparalleled we are as a nation. Which other nation would have spent the last few days, at the height of their pain and bewilderment, not baying for blood, but expressing their love for G-d and their fellow men. And resolving to respond to the events of the past week with an ever stronger effort to bring light to the world with random acts of goodness and kindness. Wrong details What a beautiful, touching story! But tell which details are wrong. I loved it, but wouldn't repeat it in it's exaggerated form. Please correct the mistakes, or at least specify the mistakes. Tragedy in India mimmics that of Israel in 1956 Thank you all, at this web site. To Anonymous from Nov 30 We cannot ever make sense of tragedies. We cannot ever make sense of losses. We can only forge ahead. Yes, the rebuilding that the Rebbe asked for was to comfort those who suffered the immediate loss, but ultimately, it IS a message to the evil ones who would do this to us: they kill, but we build,and build stronger. The Rebbe who saved a village Once more I am moved profoundly by the wisdom and charisma of The Rebbe. I'm a goy who grew up sharing Jewish customs along with my own Christian ones. My beloved maternal grandmother was a Shabbos Goy and I grew up in a predominately Jewish Boy Scout troop. I met Rebbe Schhneerson once when I was in NY studying chazanut (Jewish chant--do I have that right?) and was deeply awed by this true man of God. If He was not Mosiach he certainly was right up there and, perhaps, who knows. Hashem has a sense of humor, as young Chassid friends always say, the older boy with his trademarkl wink. Indeed, Hashem does--he made us ALL in His image and likeness! Someday, brothers and sisters, all of these divisions will be no more and we will all accept each other as we are.